I try, I really do, to be patient. The surgeon says I need time...so here's to time healing all wounds! I continue to plug through this hip journey. Regardless how I feel, I am trying to remain positive and have things to look forward to that are not, in any way, shape, or form, related to hips. Although I basically detail my hip journey on these posts, I really try not to let my hips dictate my every thought and activity. This is definitely easier said than done. I truly believe that keeping a level head and forcing myself to do things that are not related to my health is extremely important. I feel like it is so easy for a journey like this, chronic in nature, to become who we are, dictate everything we talk about and everything we think about. We are more than our hips. We are more than our pain. I'm not minimizing the fact that bad hips (or any other chronic illness or that matter) really does dictate how we live our lives, but keeping things in perspective and remember that I am not completely my hips; they are only a part of who I am is essential. I am a daughter, sister, friend, medical student. I have been surviving my chronic pain for six years now, and over this time I have been in contact with some amazing people. Having seen many perspectives on similar situations, it amazes me as to how people cope differently. I know that everybody has to do what works for themselves, it is just interesting to me how people respond to health challenges. I am currently trying to put the pieces together to return to school. I am scheduled for rotations to start Feb. 18th and I am ecstatic about this. I still have two required rotations: Emergency Medicine and General Surgery in addition to two electives (of my choosing). Since I have to do General Surgery before I do Emergency Medicine and because I cannot just hop back into rotations in my current stage of healing, I have asked to begin with an office rotation (most likely Family Medicine). Although the details are still being worked out, I am pumped to start having a schedule and be moving forward with life. Deep down inside, I am scared to see how my body will hold up because my left hip still throbs the majority of the day (especially if I do any sort of physical activity--cleaning, swimming). God know what is in store for me and I completely trust what He is doing with my life. Even when I am scared and sore, He is there for comfort and courage. For that I am thankful. Since I have been hurting more lately, I have been in contact with the head PT dude in Vail. We have been talking, on average, once a week. I am truly impressed because I feel that he truly cares about me feeling better. We are adjusting exercises according to pain levels. This and keeping in regular contact really help me feel like I am trying what I can to get this pain under control while gaining strength bilaterally. I have been instructed to reduce my Naprosyn to only 220mg BID. Ugh. 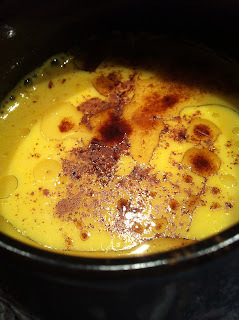 But, I have began something that I had read on Facebook: Golden Milk created with turmeric paste. At first I was leary: turmeric paste, almond milk, sesame seed oil and honey. I could barely gag it down for the first few days. When I removed the honey and added a dash of cinnamon, it was muuuuuuch better. So I drink a cup of milk with a heaping teaspoon of the paste. It really isn't that bad and it is supposed to be anti-inflammatory in nature. I'm not sure how much different I feel while drinking this every day. But it is inexpensive and I am willing to try anything at this point in the game. While speaking of foods, I am trying to eat more healthy too. Not necessarily starving myself, but counting my calories so that I remain at my current weight. Having a visual representation of the foods I eat really is an eye opening thing. I must have been eating SO MUCH before I was recording my food/calories! I'm surprised I'm not 200 pounds. Hi! First I just want to say thank you so much for writing this blog! It really feels comforting to read about other people who have had several years of pain and several disappointing surgeries! I came across your blog in a google search for labrum recontructions... I'm on a facebook group about hip FAI (you probably are too) but I have yet to find someone who has had a graft from their IT-band that has more than 2 months post-op. And I was trying to read through your blog and I might have missed it but I couldn't find why you needed another graft put in the same hip? What went wrong with the first one? I am scheduled to have my 5th left hip surgery in 3-5 weeks to do a labral reconstruction from my IT band. Just yesterday I read on one of the FAI groups that some of the docs just recently have stopped using IT bands and use cadaver grafts instead because of the not so great results in women and there for I'm searching out any who have had successful results with IT band grafts.. Would be really grateful if you would like to share how it has worked out for you! Thank you! I'm sorry you have to deal with multiple hip surgeries as well. I had IT band graft done Jan. 2012, then I attacked it with scar tissue so had a cadaver graft placed on top to act as a barrier from the scar tissue. Then had IT band graft/supplemented with a cadaver graft on the opposite hip as well. I think I have an email option on my blog...feel free to shoot me an email, I'd be more than happy to give you any more information you'd like. Good luck and maybe be in touch soon.